After spending five years working as a field and research assistant for several ornithological researchers, Katharine is now undertaking a PhD on “Predicting the effect of environmental change on biodiversity: insights from coastal bird models.” She is supervised by BU’s Conservation Ecology and Environmental Sciences academics Professor Richard Stillman, Dr Roger Herbert and John Baugh (at HR Wallingford). With changes to the environment occurring at ever increasing frequencies, the ability to accurately predict the effects on biodiversity is becoming more and more relevant. Whether these are of anthropogenic origin (e.g. disturbance and climatic) or not, having the ability to quickly and easily predict environmental impacts is of benefit to both conservation managers and their counter-parts in industry. Minimising impacts on species such as coastal birds and understanding how biodiversity responds to such changes has proved difficult in the past and so developing a method to aid in these matters will be of great relevance. 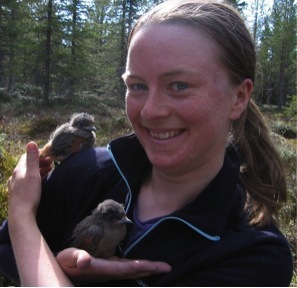 Katharine will be pursuing this aim through using and creating individual-based models of estuarine systems and their inhabitants to understand the impacts on bird species. Literature reviews and fieldwork will also be carried out to add to the knowledge gained through modelling and to assist in developing new parameters.